Most restaurants typically eschew putting chicken at the front of their menu, instead emphasizing other meats such as beef, pork and seafood. However, with the right restaurant, a poultry dish can be as flavorful and enriching as its bovine counterparts. Bantam + Biddy is one such restaurant, specializing in southern-style chicken rotisserie with an emphasis on the local free-range foods trend recently popularized by the culinary world. The restaurant’s chief delicacy is its Carolina chicken rotisserie. A quarter or half of a fowl that has been roasted on a spit, it is rich in taste and particularly juicy. The meat is tender and moist, practically melting in one’s mouth. The dish also comes with a choice of two sides. Three noteworthy ones are the duck-fat fries, the loaded mash potatoes and the pickled beets with goat cheese. While not particularly different from normal fries, french fries cooked in duck fat are a much heartier and more filling alternative. The pickled beets take the opposite tact with a much sharper, bitter taste. Even the goat cheese fails to temper this flavor. While definitely providing a kick that the savory, yet mellow chicken lacks, it may be too strong for most taste buds to enjoy. The loaded mashed potatoes are mixed with cheese and provide the same filling element as the french fries. In addition to food, Biddy also provides an array of homemade beverages. This includes the standard local, organic milks and juices but also features homemade sodas. One such flavor of soda is wild berry limeade. The drink is a mix of sour and sweet flavors but lacks the level of carbonation needed to truly be a soda. While enjoyable, it is really more of a juice than a soda. The rest of the menu is simple, yet substantial, and features a particularly large breakfast selection alongside its lunch and dinner menus. It also makes a point of distinguishing its vegetarian and gluten-free options. The breakfast features hearty southern dishes, such as a three-egg omelet with goat cheese and spinach, as well as fried chicken and waffles. One can even get a bowl of farro cereal with sorghum milk. There are some more ethnic dishes like pork schnitzel and chilaquiles, which are tortillas with egg and avocado. The rest of the lunch and dinner menu have the standard sandwich options among other foods, such as meatloaf sandwiches and falafel wraps. The entrees are more diverse, ranging from chicken tenders to salmon filets. Some of the breakfast dishes, such as chicken and waffles, are also served in the post-morning menu. Founded by Shaun Doty and Lance Gummere, Bantam + Biddy continues the trend of Doty’s other restaurant, Yeah! Burger, by providing American-style cuisine in a local, sustainable manner. Both restaurants place equal importance on the quality of the ingredients as they do on the skill used to create the final product. The décor of the restaurant is similar to the style of Yeah! Burger. This modern, austere look has become quite popular in many chain restaurants as well, such as Chipotle and Panera Bread. With an emphasis on minimalist style and simple frames, it is similar in look and feel to the furnishings one might find in an Ikea store. Service was top-notch with a waiting staff that is both attentive and responsive to the customers’ needs. Parties are seated immediately and food is out within approximately ten minutes of ordering. A full meal at lunch typically costs about ten to fifteen dollars without tip or drink. The new location near campus at Crescent Avenue is actually the second installation with a previous location at Ansley Mall. The restaurant is open daily from early morning hours to just before the late night period. This is a unique restaurant that blends traditional American cooking with higher-level goals of localization and sustainability. While some of the sides may not be suitable for many palettes, the core dishes more than make up for this shortcoming. 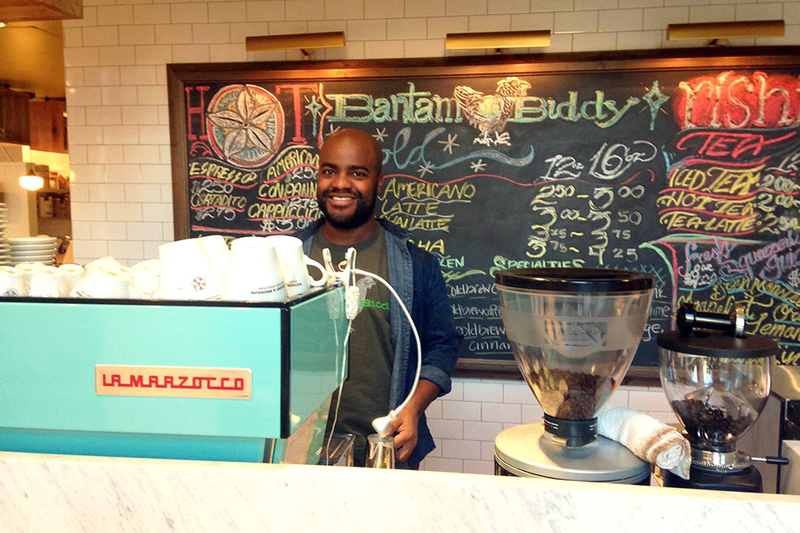 Bantam + Biddy is a fast, thrifty place to high-quality, sustainable food.